Meet Papú, our newest and smallest ambassador-in-training. Ambassador animals have an important role at Woodland Park Zoo—they allow visitors to have up-close experiences and serve as catalysts for educating about their species. By interacting with them, we learn more about their wild cousins. We learn more about ourselves and our impacts on the ecosystem. We are moved to protect them and the wild spaces they represent. Simply put, we love them and they inspire us to make conservation a priority in our lives. It’s a big responsibility. What does it take to become an ambassador—to fulfill such an important role connecting people to wildlife? The answers to these big questions can often be found in the littlest places—and in this case, an egg barely the size of a ping-pong ball. The tiny egg came to Woodland Park Zoo from Sacramento Zoo, where its parents were not able to incubate it. On April 17, a feisty little bird pipped its way out of that egg. Meet Papú, a male. 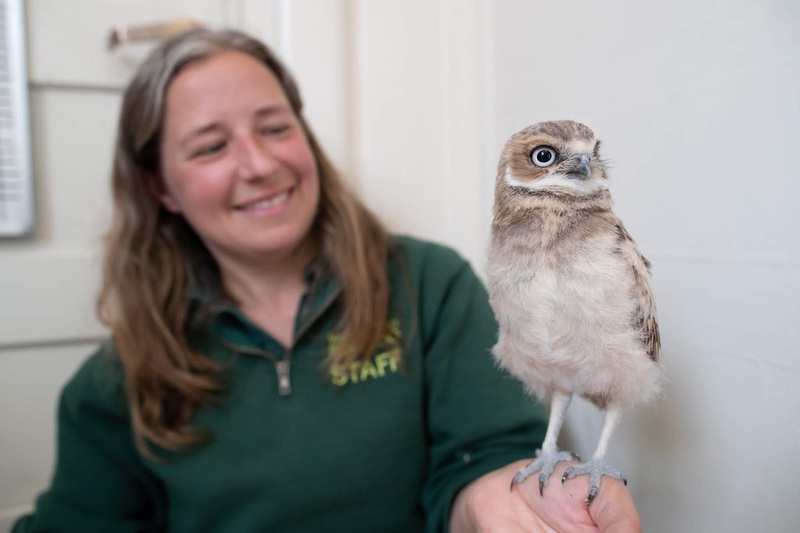 His name, which is pronounced like paw-POO, with emphasis on the second syllable, means “burrowing owl” in the dialect of the Yakama tribes of Eastern Washington and it is also the name of his species. Little Papú, who also goes by the nickname Pippin, was barely a few inches long, covered in white downy plumage, and like all birds at hatching, his eyes were not open yet. 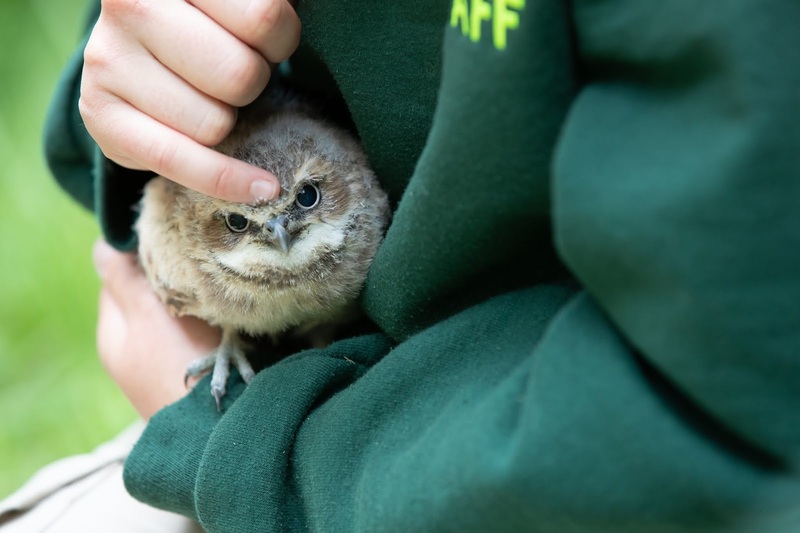 Right away, he captured the hearts of the dedicated animal keepers who will feed him, raise him, train with him throughout his life, and generally just let him become his best little owl-self. He is quickly capturing our hearts too. 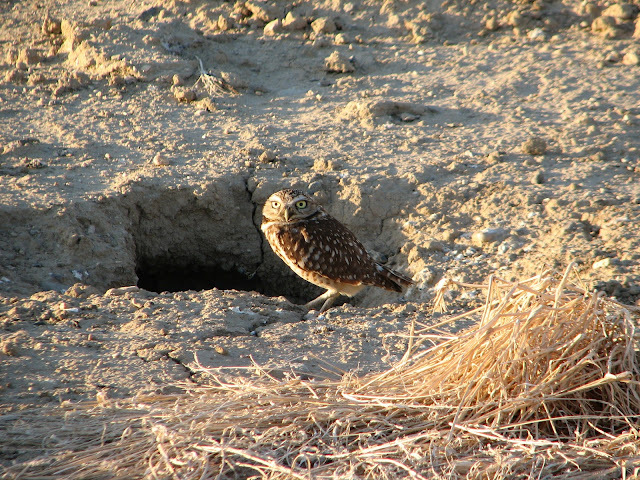 Burrowing owls (Athene cunicularia) are small, long-legged owls found throughout open landscapes of North and South America. These tiny predators—they’re only 8 to 11 inches tall and weigh between 5 to 8 ounces when fully grown—can be found in grasslands, rangelands and throughout the Great Plains. When fully grown, an adult burrowing owl has mottled brown and white plumage with yellow eyes and a yellow bill. Photo by Karen Riesz via Flickr, Creative Commons. They nest and roost in underground burrows that might have been dug out by prairie dogs or ground squirrels, although they can create their own burrows if needed. 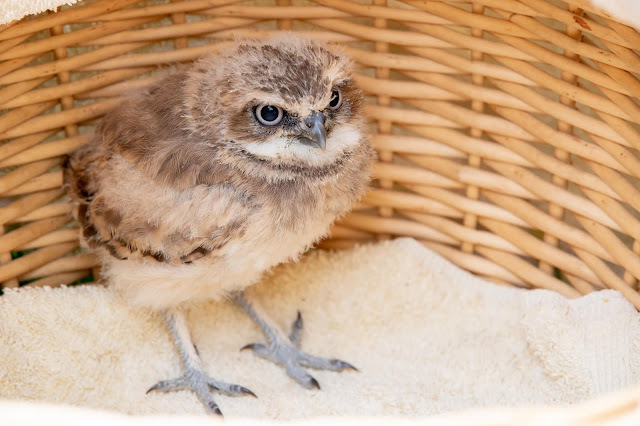 Unlike most owls, burrowing owls are often active during the day, doing most of their hunting for beetles, grasshoppers, crickets, mice and small lizards between dusk and dawn. 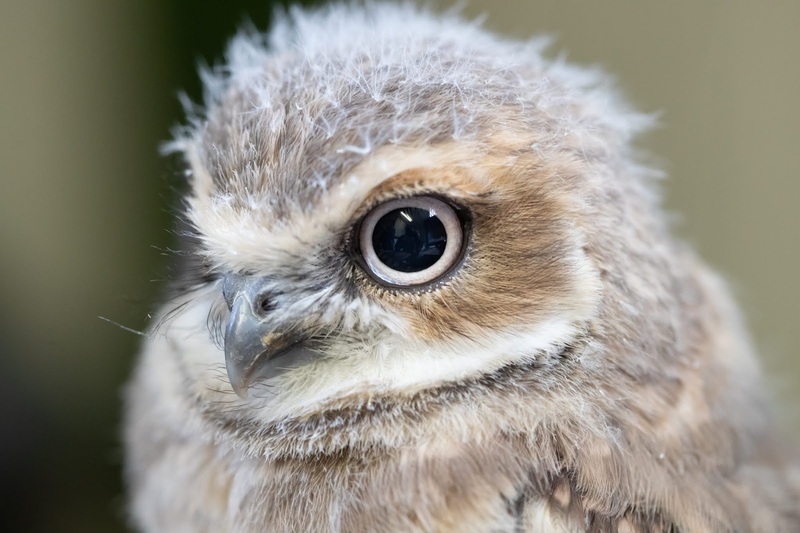 The burrowing owl is endangered in Canada and threatened in Mexico. Although still common in much of the U.S., its population numbers are in decline and they are listed as threatened in several states due to the eradication of prairie dogs and loss of habitat. Over the next weeks and months, we’ll follow Papú as he grows and bonds with his keepers. We’ll provide lots of updates on what he’s learning and what we’re learning from him. For now, his education involves short trips outside (in the arms of one of his keepers) mixed with lots of exploring around the zoo’s raptor barn. 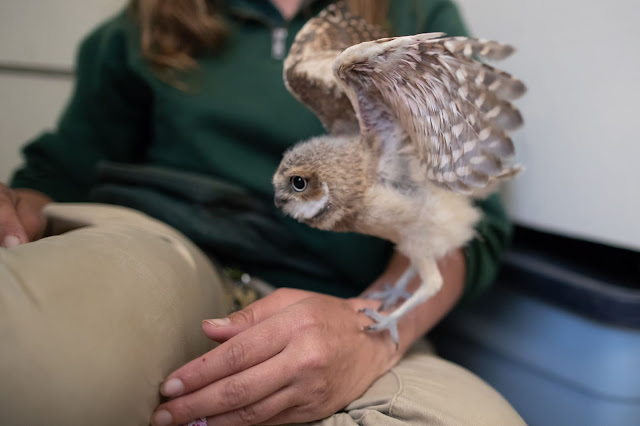 Every day he spends time bonding with his keepers as he exercises and learns to coordinate those long burrowing owl legs. His curiosity is rewarded with lots of little breaks for tasty cricket snacks—a burrowing owl favorite. He’s 7 weeks old now, and already adult-size, although he still has some of the downy plumage of a chick. 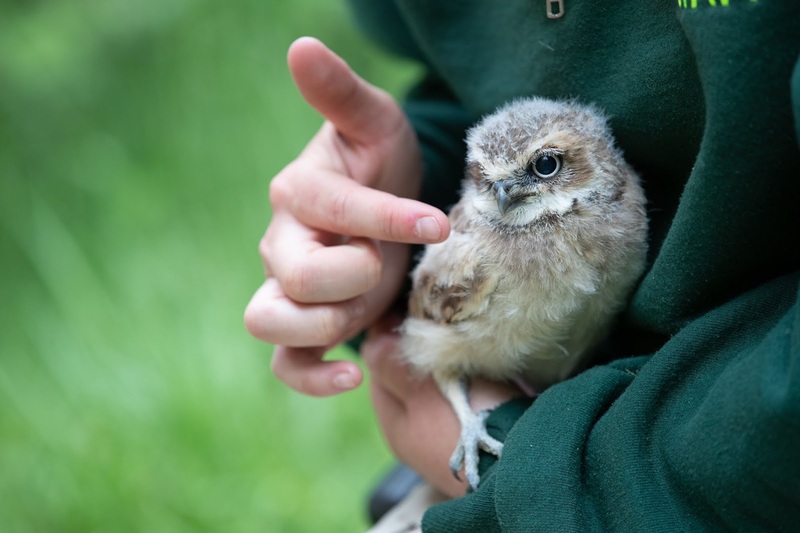 Most baby birds are the same size as their parents by the time they’re ready to leave the nest—and Papú is just at that age. Adult feathers, which are mottled brown and white, are already starting to grow in, including those all-important flight feathers. At this point, his flights are limited to mostly practice take-offs and soft, but not always graceful, landings on his keepers’ laps or the ground. Within another week or so, he will probably take his first real flight, and by early autumn Papú will have his adult plumage and his eyes and beak will start turning yellow. In the coming months, he’ll work with his keepers—they are his family—to master the most important role of being an ambassador animal: meeting and greeting zoo guests. We'll check in on his progress as he grows, but for now, he’s just a cute and curious young owlet. Welcome to the world, little one! We’re already in love with you!